Pyramids Treasure Classic Slot Guide & Review - Casino Answers! Pyramid’s Treasure is a 3-reel, 3-line classic slot machine developed by Random Logic, featuring free spins. You can play the Pyramid’s Treasure classic slot machine at Bovada. Pyramid’s Treasure is an Egyptian-themed slot machine. Symbols on the Pyramid’s Treasure slot game include various gods from Egyptian mythology, including Ra, Seth, Osiris and Isis. There is also a Pyramid symbol. Pyramid’s Treasure is presented as if it was in a real-life casino. To change the view of the slot, you can hit the “Switch Machine” button. 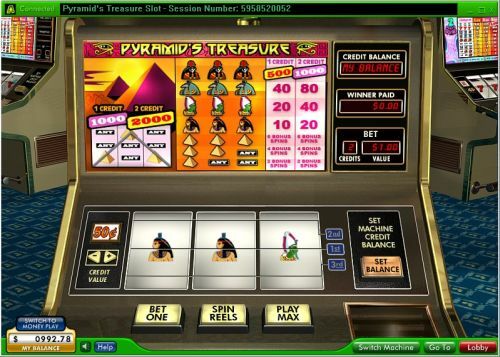 For a look at the Pyramid’s Treasure classic slot game from Random Logic, a screenshot is below. Bets on the Pyramid’s Treasure slot machine are $0.05, $0.25, $0.50, $1 and $2. You can bet 1-2 coins per spin. All three paylines are enabled at all times. Pyramid’s Treasure is a nickel slot, thus you can play anywhere from five cents up to the maximum total bet of $4. Pyramid’s Treasure is ideal for low stakes and casual slots players. To play one coin on Pyramid’s Treasure, hit “Bet One” followed by “Spin Reels.” To play both coins (recommended), press the “Play Max” button. The top jackpot on Pyramid’s Treasure is not won by a simple winning combination on a payline. Instead, you need to hit a Pyramid symbol at the bottom of reel 1, the top of reel 2 and the bottom of reel 3, forming a pyramid. If you do this on a maximum bet of 2 coins, you will win the 2000 coin top jackpot. The second highest payout on Pyramid’s Treasure is the Ra symbol, which will pay 1000 coins on a 2-coin maximum bet. You can win the pyramid’s treasure by winning one of these top payouts when you play the Pyramid’s Treasure slot game at Bovada! Rather than low payouts, the Pyramid’s Treasure pays out the low-end of its paytable in free spins. You can win 2 free spins by hitting 1 Pyramid symbol, 4 free spins by getting 2 Pyramid symbols or 6 free spins by landing all 3 Pyramid symbols in a row. There are 5 paying winning combinations on the Pyramid’s Treasure classic slot machine. The complete payout schedule is as follows (1/2 coin payouts in parenthesis): 3 Isis symbols (10/20), 3 Osiris symbols (20/40), 3 Seth symbols (40/80), 3 Ra symbols (500/1000) and 3 Pyramid symbols in the form of a pyramid (1000/2000). Pyramid’s Treasure does have a few interesting twists to it. The first is that is pays out in free spins rather than cash winnings. This is more similar to most slots than you’d think because the majority of smaller wins end up going towards the next spin anyway. The second is the fact that the top paying winning combination must be in a triangular pyramid shape rather than a straight or diagonal payline. These twists make Pyramid’s Treasure into an intriguing slot machine to play. You can try it out for yourself by signing up and depositing at Bovada! How do I win the top jackpot on the Pyramid’s Treasure slot machine? Here’s how you can win the 2000 coin top jackpot on the Pyramid’s Treasure online slot machine. First, select your coin value (or bet) to the left of the reels. After that, hit the “Play Max” button. The Pyramid symbol must now land in the following positions: Line 3 on Reel 1; Line 2 on Reel 2; Line 3 on Reel 3.